Louis Comfort Tiffany was born in New York City to Charles Lewis Tiffany and Harriet Olivia Avery Young. (He died in 1933). He attended Flushing Boarding School in New York City. The Civil war starts in April of 1861 and in 1863, Tiffany attended the Pennsylvania Military Academy, in West Chester, Pennsylvania. It later became the West Chester Military Academy and then the Villa Maria Academy, a Catholic school. Tiffany then went on to Eagleswood Military Academy in Perth Amboy, New Jersey. In July of 1864 Tiffany wins an award for proficiency in drawing while at Eagleswood. The war ends in 18 while Tiffany is at an encampment at Irvington-on-Hudson, New York. In 1866 he is listed as a member of the American Society of Painters in Water Colors. Tiffany studies with a private teacher and was then admitted to the Antique School in the National Academy of Design in New York City in 1866. In 1868 Tiffany travels to Europe and studies with painting and visits the French painter Belly who specializes in orientalist landscapes and Islamic genre scenes. Two years later he has a still life exhibited at the Paris Salon and has an exhibit in the National Academy of Design, New York. After this the exhibits become frequent of his water colors. After extensive travel, Tiffany acquired the property known as Laurelton Hall. Much of this building can be seen at the Morse Museum. FINALLY—IN 1872 Tiffany becomes interested in glass. The first experiments led to the invention of Tiffany’s Favrille Glass. 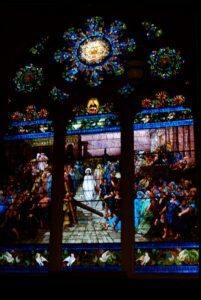 In 1876 Tiffany meets John La Farge who is has glass working studio in New York City. In 1878 Tiffany opens a glass house which burns down as does the second one he opens. Also, in 1878 he made his first church figure window. It is at St. Mark’s Episcopal Church in Islip, New York. It’s where abouts now is unknown. He continues to work in water color and some oils. He experiments with Wallpaper designs and photography. In 1879 he designs and installed an abstract window in one of his own residences. 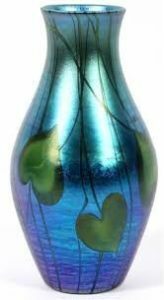 On November 10, 1879 John La Farge applies for his first patent on opalescent glass. After several jobs decorating interiors, Tiffany starts devoting all his time to artistic house furnishings. Then he submits patents for Glass tile, Mosaic and Colored Glass Windows. In 1881 Tiffany buys two buildings for his glass decorating business in NY. At this point he is getting commissions for people’s homes and churches. He is winning awards at expositions. 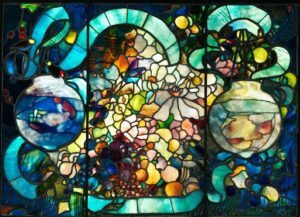 In 1885 he designs the Flower, Fish and Fruit window which is now in the Baltimore Museum of Art. In 1887 Clara Wolcott Driscoll starts work as a designer at Tiffany Glass Company. Clara ends up doing many lamp designs. The Arrowhead shade. In 1904 Mrs. Driscoll is one of the highest salaried women in New York and ranks with the $10,000 a year workers. In 1889 Harper’s magazine says that Tiffany has brought the art of making opalescent glass to the highest perfection it has yet attained. He is referring to the piece “Christ Leaving the Praetorium” which is in Wisconsin at St. Paul’s Church. At this point they open an entire ecclesiastical department. Tiffany’s first public exhibition of blown glass is in 1893. In 1892 is the first exhibit of glassware and lamps with blown glass shades. 1894 is the first mention of copper-foiling at Tiffany Glass. in 1896 this gentle is at Tiffany’s. I am including it because my last name is also Parkhurst! Henry L. Parkhurst (1867-1921) of the Tiffany Glass and Decorating Company (1892-1900) teaches book cover designing at the New York School of Applied Design for Women. In 1919 Louis Comfort Tiffany retires. He creates a foundation. 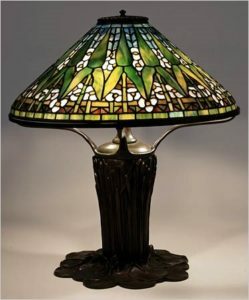 In February of 1924 the lamp production ceases at Tiffany Studios. January 17, 1933 at the age of 84, Louis Comfort Tiffany dies. This entry was posted in Events on February 16, 2019 by admin. Subscribe to our Newsletters to stay current with everything happening at Stained Glass Express!